Blacket built this house for his large family and lived in it whilst working on the Sydney University buildings. 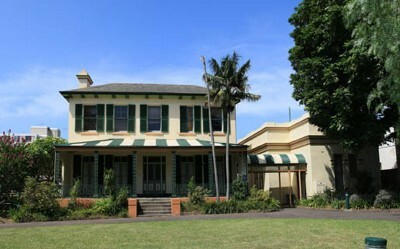 In 1870 he moved to Balmain. Bidura posesses clear lines and classical proportions. Architect Graham Jahn notes that “the walls are of handmade bricks, rendered to give the appearance of stone coursing”. The villa has a slate roof, French windows and shutters, decorative cast iron verandah staunchions and rails and a separate (later) ballroom. It is set back from the street with a semi-circular drive. Bidura is currently used by the Department of Community Services.